BUILDING FOR THE FUTURE •	NYMC unveiled the state-of-the-art 21,000 square-foot Clinical Skills and Simulation Center, where students receive hands-on training in a replicated hospital setting with standardized patients and mannequins to hone clinical skills in a safe and controlled environment before treating actual patients. •	NYMC acquired 19 Skyline Drive, a 248,000-square-foot, five-story building providing essential space for offices and new programs. 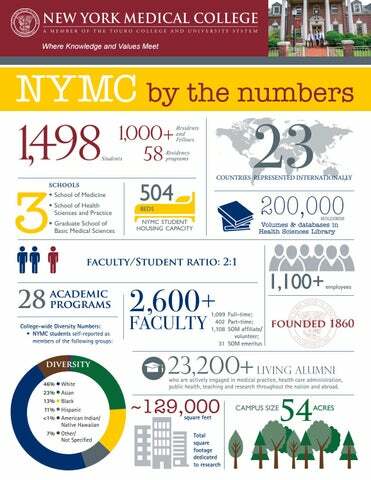 •	NYMC launched a transformative biotechnology incubator, BioInc@NYMC—the only incubator of its kind in the region located on a medical school campus. •	The Dr. Edward F. and Mrs. Anna M. Asprinio Fitness Center opened, offering a state-of-the-art wellness and workout facility for the NYMC community. 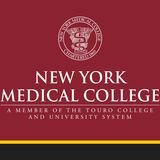 •	The Touro College of Dental Medicine at New York Medical College (TouroCDM) opened in 2016 making it the first new dental school in New York State in nearly half a century. •	In 2018, TouroCDM opened a state-of-the-art 32,000-square-foot oral health care facility, Touro Dental Health. •	NYMC and Westchester Medical Center Health Network (WMCHealth) signed a 12-year Academic Affiliation Agreement to strengthen the academic medicine programs, clinical care and research practices of both NYMC and WMCHealth. •	A Center of Excellence in Precision and Responses to Bioterrorism and Disasters was created to provide expertise and leadership in preventing, diagnosing and treating public health threats specific to biological and chemical terrorism, and public health emergencies and developing medical countermeasures.